Considered one of the pillars of the African Economic Community, the organization was founded in order to achieve "collective self-sufficiency" for its member states by creating a single large trading bloc through an economic and trading union. It also serves as a peacekeeping force in the region. The organization operates officially in three co-equal languages – namely French, English, and Portuguese. The West African Economic and Monetary Union (also known as UEMOA from its name in French, Union économique et monétaire ouest-africaine) is an organization of eight West African states, and a subset of the ECOWAS group. It was established to promote economic integration among countries that share the CFA franc as a common currency. UEMOA was created by a Treaty signed at Dakar, Senegal, on 10 January 1994, by the heads of state and governments of Benin, Burkina Faso, Côte d’Ivoire, Mali, Niger, Senegal, and Togo. On 2 May 1997, Guinea-Bissau, a former Portuguese colony, became the organization’s eighth (and only non-Francophone) member state. Among its achievements, the UEMOA has successfully implemented macro-economic convergence criteria and an effective surveillance mechanism. It has adopted a customs union and common external tariff and has combined indirect taxation regulations, in addition to initiating regional structural and sectoral policies. A September 2002 IMF survey cited the UEMOA as "the furthest along the path toward integration" of all the regional groupings in Africa. 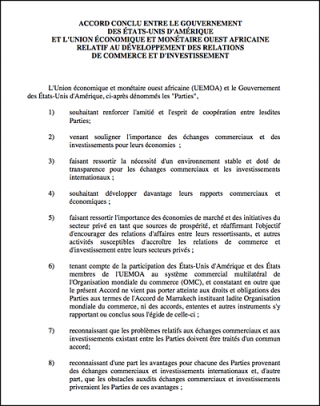 The trade data provided in this section relates to the UEMOA countries Benin, Burkina Faso, Ivory Coast, Niger, Senegal and Togo (Guinea Bissau and Mali are excluded as they are not currently an AGOA beneficiaries). 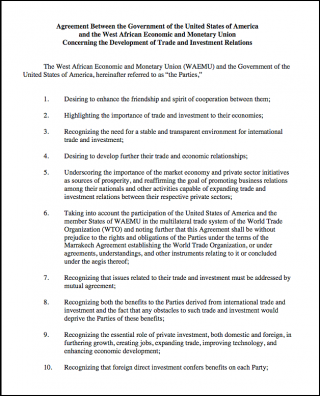 Trade and Investment Framework Agreement between the West African Economic and Monetary Union (WAEMU) and the Government of the United States of America.